At Envato, we take our users’ account security very seriously. One of the ways we protect your account is through Sign In verification, a feature to make sure that the person who signs into your account really is you. Whenever you sign in to your Envato account, we perform a number of checks against various trust signals. These signals determine whether to proceed with the sign in as normal, or whether to start a verification process. If we need you to verify your Sign In, you’ll be directed to a page asking you to enter a passcode. Our system will automatically email your unique passcode to the email address associated with your Envato Market account. Is sign-in verification going to keep bothering me every time I sign in? It depends. Once you've successfully verified a Sign In, our system will remember this as an Authorised location. The next time you try signing in from the same location, we won't ask you to enter a passcode. In the off-chance that you try to sign in from a new/different location, we'll ask you to enter a passcode again. Don't worry, we'll remember this new location too - so there'll be no need to verify the new location a second time. I’ve been waiting patiently but haven’t received my passcode email yet. Was the email sent to your Spam/Junk folder? Are you checking the right email address? 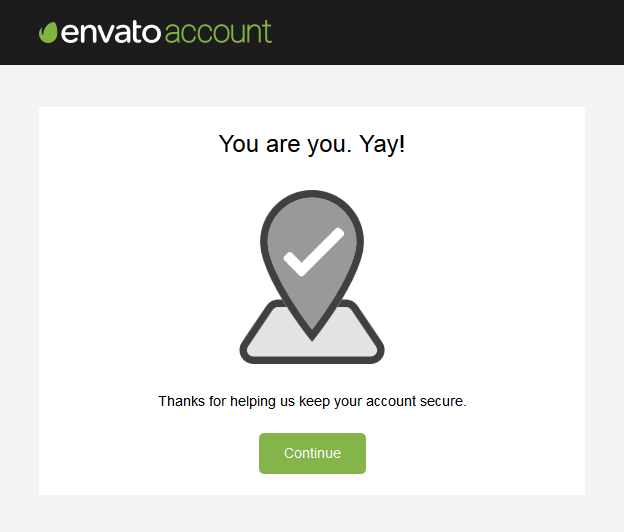 Your passcode will be sent to the email address entered into your Envato Market account. If you have a custom email address, is there any server-level filtering that could have prevented delivery of the email? Very occasionally our emails will be rejected by your host’s server. Please contact our Support Team if you believe this is the case. What happens if I don’t have access to my account’s email address anymore? Your email address is the primary contact method for any security related communication, such as password resets and sign in verification. It is important you keep your email address up-to-date at all times. If for some reason you can’t access the email address we have on record, please contact the Envato Market Help Center for assistance in recovering your account. What else can I do to protect my Envato account? 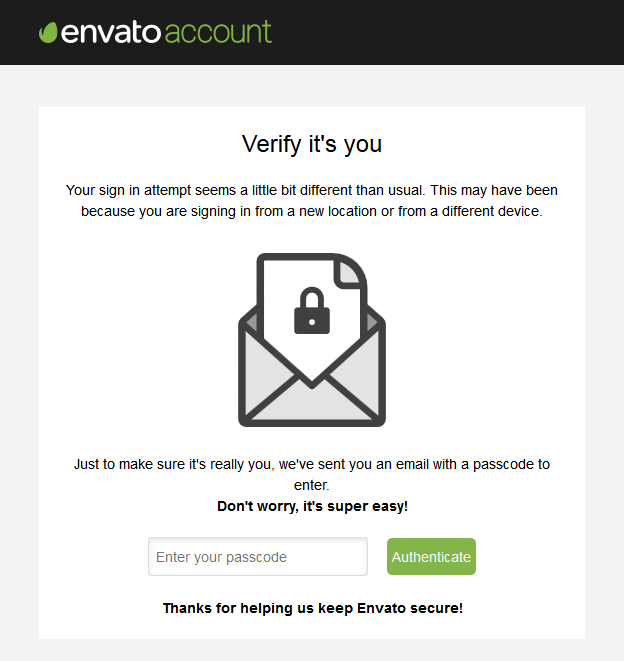 To protect your Envato account, please follow our guidelines on using a strong password.